Fancy pizza but can’t have it since going low carb? 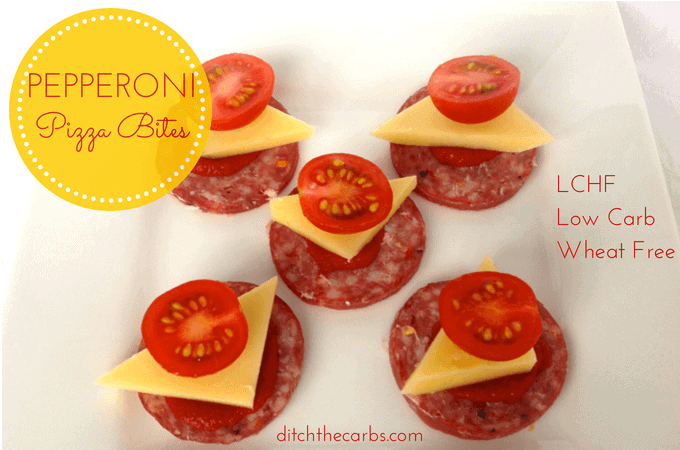 Try these pepperoni pizza bites. 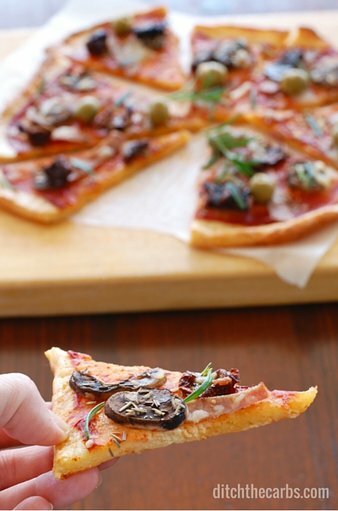 Enjoy all the flavour of pepperoni, tomato paste, cheese and tomatoes, or try your favourite topping. So instead of having the stodgy, wheat based pizza base, just load your toppings onto the pepperoni slices. They are so filling, you will only want a few. We all know the topping of pizza is the best bit, so now you can have it, minus the carbs. These are also great to put into lunch boxes for morning tea or a snack. 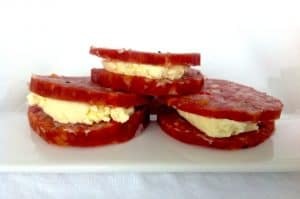 Add some cream cheese and make a pepperoni sandwich. How about sliced mushrooms, feta cheese, blue cheese, olives, sundered tomatoes in oil? Find good quality of pepperoni with no wheat or other fillers. Keto pepperoni pizza bites are the perfect game day snack. Place any combination of toppings onto the pepperoni slices. No nutritional notes can be given as everyones pizza bites will vary with your choices of toppings. 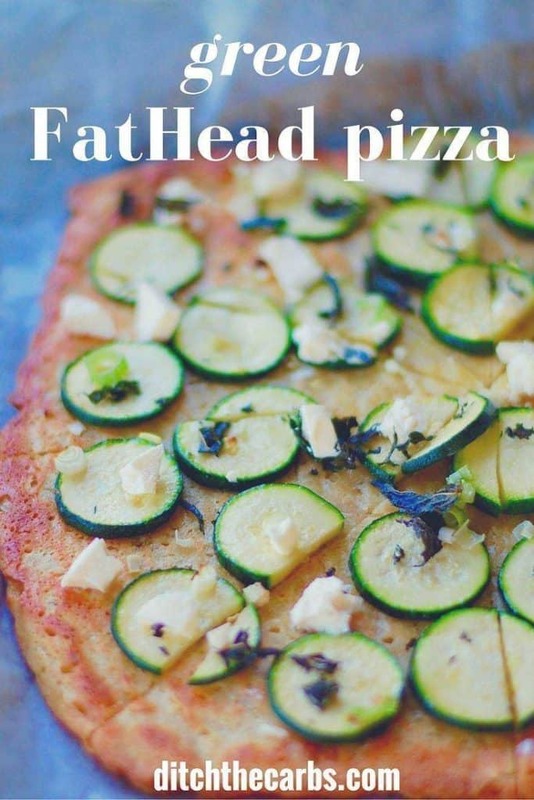 Why not try my famous FatHead pizza? There is a regular version and a green version. They are the top recipes for the entire website. Good morning! Just letting you know that I featured this recipe in a round-up of 50+ Low-Carb and Gluten-Free Superbowl Party Appetizer Recipes. Hope a lot of people will click over from my site and check it out! Awesome thank you Kalyn. I took a look at your round up looks incredible. Thank you for including me. Libby. Hi there, I struggle with all the ‘crap’ in pepperoni / salami / chorizo. Are you able to tell me the best brands in your opinion ? Ps : Absolutely love your website – have been on a LCHF journey for about 2 years now and this is by far the best website I have found !!!!!!! Wow Jane, that is the kindest feedback, how lovely of you. I get what you are saying about the ‘crap’ in pepperoni. I try to find ones which have the least preservatives and no colourings etc. At the moment I buy Otellos with no preservative, additives, no gluten just organic meat, herbs and spices. Yum! These look amazing – and so easy! Incredibly easy, and you can create whatever topping you like.